Such a code is laissez-faire or “free-market” capitalism and libertarian fundamentalists are its zealots. 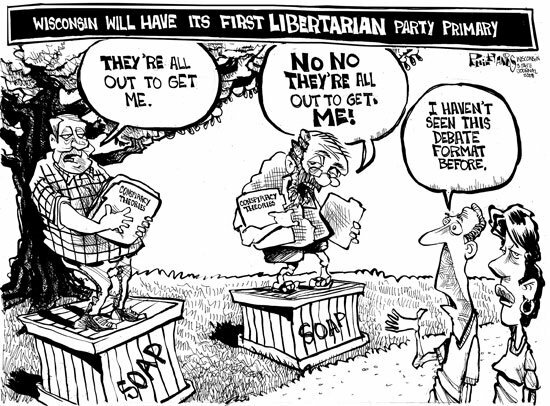 Anti-competitive, predatory, monopoly capitalists and robber-barons in the USA promote this ideology because the word libertarian resembles the word liberty and US Americans have a cult of individualistic freedom. The crux of libertarian fundamentalism (or extreme libertarianism) is how differently it treats the issues of coercion and tyranny in the private and public sectors. 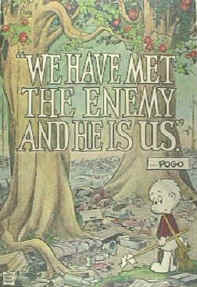 The ideology asserts (on theoretical rather than empirical grounds) a natural bias towards freedom and justice (and against coercion and tyranny) in the former and the opposite in the latter; and it generally turns a blind eye towards the concentrations (and abuses) of power in the private sector that can be observed in weak states just as often as in strong ones. Libertarian fundamentalism asserts, again without empirical evidence, that courts of law are more dependable regulatory mechanisms of social and economic justice than democratic legislatures. Many of the most powerful promoters of libertarian fundamentalism are themselves unscrupulous crony capitalists who gain advantage by corrupting and manipulating our legal and political institutions. Look, I’m all for liberty, freedom, individuality, etc. but on some level these are optimized under a regular order of some kind. Rules. We have these even in war and football. The solution to cronyism is not smaller government, fewer rules, fewer referees. The best alternative to corrupt government is not no government, its uncorrupted government. Solutions are those that reduce corruption and increase accountability. No pundits were harmed or jargon used in the production of this message. When I was a schoolboy, back in the day when “civics” and “social studies” were taught, we heard over and over that freedom or liberty always came with responsibility. But that is too nebulous. As the final words of the US Declaration of Independence solemnly affirm, we must “mutually pledge to each other our Lives, our Fortunes and our sacred Honor.” Individualism must be tempered with an equal measure of cooperation and service to the community of life on earth. 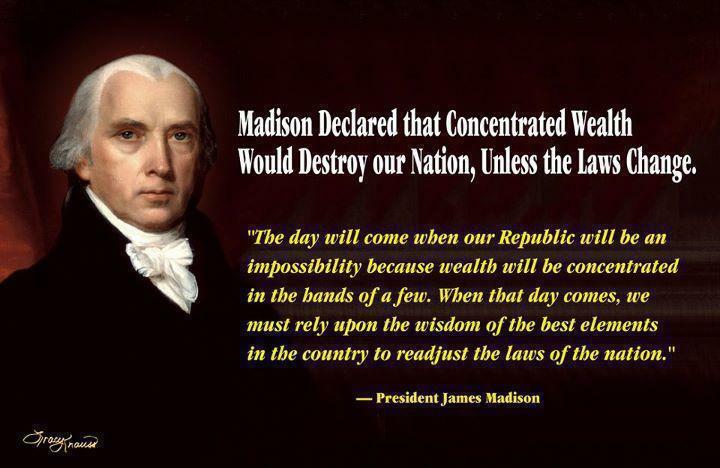 We owe a debt to all that has come before and all that will follow. Individualism without an equal measure of formal, committed cooperation and service literally has no place in the modern world. This is the pathology and poverty of the libertarian fundamentalists’ one-sided individualistic position. “That’s what freedom is all about: taking your own risks.,” Paul said, repeating the standard libertarian view as some in the audience cheered. “But congressman, are you saying that society should just let him die,” Blitzer [CNN] asked. Susan Grigsby’s brother Steve died a painful death fighting for care as an uninsured American. Susan watched, horrified, as the GOP Presidential Candidates on CNN’s Tea Party Debate stood silent when the the audience cheered for the idea that we as a society should just let an uninsured man die. Now Susan wants an answer from each and every GOP candidate. That’s how Ron Paul described his campaign manager’s early, uninsured death. This is a classic case of libertarians claiming that they are taking their own risks, but somebody else ends up having to pay. There is a simple reason why libertarians routinely lie this way: their ideology claims they are independent, but the reality of human socialization is that we are interdependent in many ways. Through families, churches, friendships, professional associations, employment, etc. We routinely and informally assume responsibility for each other. “In an interview on Hardball With Chris Matthews on MSNBC, Republican Senator Mike Lee of Utah admitted that he wants to bring America to its knees if an amendment is not passed in Congress that would force Americans to live under conservative governance despite which party the people elects. Here is the transcript. Its too bad for these libertarian fundamentalists that Niccolo Machiavelli, the Marquis de Sade, and Ayn Rand were not among the founders and philosophical progenitors of the United States. Another error of libertarian fundamentalism, American style, is to abhor the capacity for tyranny in the state and ignore the capacity for tyranny in its alternatives. Naturally there are values and ideas in classical libertarian thought that I share, but its seductiveness can’t be explained by these alone (or I guess I might be a libertarian). This post mostly talks about libertarian fundamentalism the way it is found in the US today. It might better be called neo-libertarianism, juvenile libertarianism, or euphemistic libertarianism . As Noam Chomsky explains in the following brief video, a US libertarian fundamentalist is the opposite of a libertarian in the rest of the world, where much of what we call libertarian fundamentalism might be called neo-liberalism. Like fundamentalists of all ideologies, libertarian fundamentalists are the unwitting dupes of “the powers that be” (TPTB). Despite their claims to idealism, they are at best the inadvertent enablers of oligarchy. The main problem that I have with libertarian fundamentalists is that underneath the faith-based, laissez-fairyland dogma they are often (naively or accidentally) anti-democratic, anti-social, anti-scientific and even un-American. 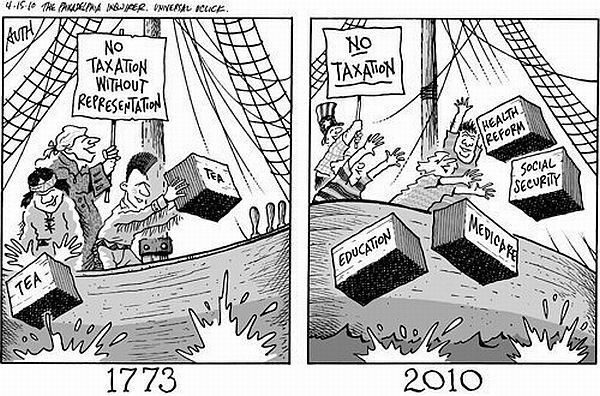 Their proposition that all taxation amounts to theft by a corrupt, rogue state does not square with the views of prominent American Revolution patriots. Libertarian fundamentalists are also unintentional anarchists. In their single-minded preoccupation with the very real dangers of state tyranny, they would leave the door open and unguarded against private cartels, robber-barons, and warlords. The power of concentrated mass media (in the “invisible hands” of private puppet masters) to persuade the public against its own self-interest would be unopposed by any representative of the collective public interest. 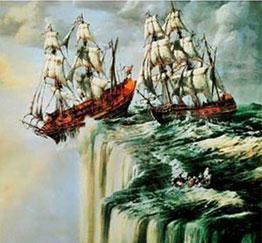 Scholars have observed “Libertarianism began with some pretty radical thinkers.” Yes, and I have some resonance with early libertarian thought, but since in all the intervening years they haven’t managed to substantiate any of their theorizing with empirical evidence or real-world examples, their ship has listed sideways off the edge of the real world. Where is an example of a successful fundamentalist libertarian society? The Sudan? 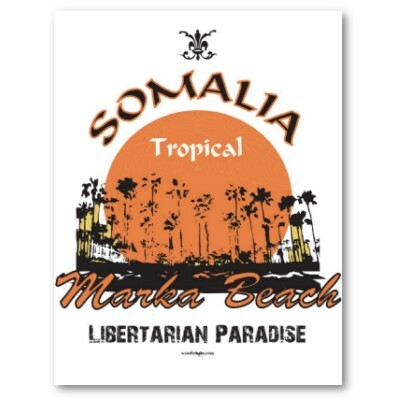 Somalia? 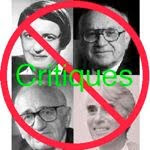 Libertarians will protest that their Austrian & Chicago schools of economics have produced a great deal of scientific economic theory in support of free markets, the invisible hand, the rational agent, etc. The problem is that much of this is propaganda, in support of the ruling corporate regime, wrapped up in academic-sounding jargon. It is science fiction, fantasy, and half-truth. Some of this economic mythology is debunked in the Economical Bestiary. Other rebuttals can be found among the links below. 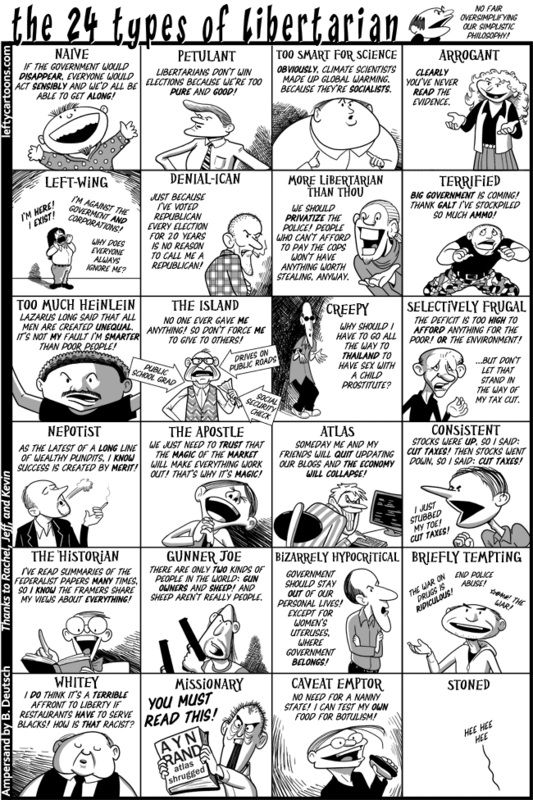 Some libertarian fundamentalists also display the character traits of both Narcissists and sycophants, seeking to garner unearned authority, importance, or financial gain by associating themselves with business leaders, corporate think tanks, or eccentric cult figures such as Ayn Rand who pose as maverick philosophers. Rand devotees accumulate points towards sado-masochistic favors from the mistress in the afterlife by endlessly carping at everyone else in the public square (which they want to privatize). They should never be seated with the adults. 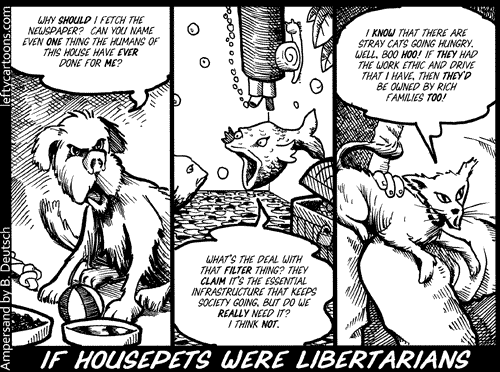 Libertarianism in One Lesson. Mike Huben’s guide to becoming a libertarian. If you’ve argued with libertarians, you’ll understand them well enough to ROTFL. 🙂 for the humor-impaired. A general introduction to discussion with libertarians, with an extensive discussion of arguments commonly used by libertarian evangelists. This is the original FAQ, little changed from when it originated in 1994. Twenty views of the big picture of libertarianism. Claims widely adopted by libertarians that are spectacularly wrong. 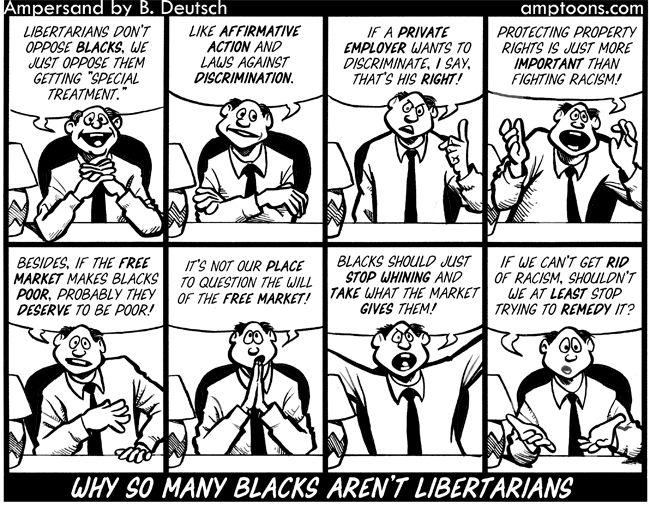 Libertarianism is based on bad arguments. Here’s a list of some common problems with libertarian arguments. So don’t we end up as libertarian when the country goes broke and all the govt programs go broke. This is what drives me toward libertarianism. Do you all feel that this govt can just keep printing and borrowing the money it takes to keep bailing every individual out of the problems they face? I would like to know how this can be done? Roger, thanks for the comment. Sorry for my slow reply. “Bailing every individual out of the problems they face” is a gross exaggeration. Since I don’t know anyone in the liberal or progressive mainstream who advocates such an extreme role for government, I’d call that a blatant straw man. If the government “goes broke”, depending on how you define that, yes–that would tip things toward a more libertarian state, which is probably why many libertarians favor policies that undermine the fiscal viability of the government, i.e. “starving the beast,” regardless of who they might harm. Financial viability and stability can be threatened by too much austerity as well as by too much spending, and we have to consider the differences between things like short-term counter-cyclical stimuli versus long term budget balancing. Tax revenues can be collected fairly or unfairly and can be invested wisely or unwisely. We need fair and honest accounting and scientific cost-benefit analyses based on empirical data–not ideology. Thank you for providing this very insightful blog for us to read. I am also happy to see that you in your replies to your opponents keep a polite tone – a quality that many people on the internet lacks! I see myself as a moderate libertarian (or maybe classical liberal is the more correct term). And though I find this post quite humorous and also correct in most of its critiques of this fundamentalist libertarian movement – it also saddens me a bit. This is because I see that many of these articles critiquing libertarianism tends to attribute these critiques to all libertarians and this annoys me a bit. We are not all randians! What is central to most libertarians is the idea that every individual has a right to make use of their personal freedom however they see fit, provided that they do not impede the rights of other individuals to do the same. It is tremendously important for me to remain both socially and financially free and though the government helps sustain this freedom it also has the power to take it away. And this is the reason for my mistrust in the government and why I always take very critically to new restrictions and regulations imposed on the public. Note however that I do realize that a marked capitalist system produces some unfortunate externalities: mainly poverty and hardship for some people. And most libertarians I know (my self included) actually believe that there is a case to be made for relieving distress through some government measures. An example of such a measure could be some form of income guarantee, which would provide people with the means to sustain a basic living, even if they are unable to find work. Most of us actually believe in giving people a fighting chance. I hope this gives you a broader perspective. Even though all libertarians hold the same view: you should be free to do exactly what you want, provided you do not impede the freedom of other people to do the same – for most of us it actually does not mean that this principle should be taken to its logical conclusion. You can have some measures which mitigate hardship, be in favour of social and financial freedom and have mistrust in the government. Now you’ve heard my stance. I’m also interested in your position; I now know that you are not a libertarian, so how would you structure society? I’m not asking you to describe your utopia here, but I would like to know which changes you would see implemented in order to make society better. I’m not asking you to go into great detail either, I would just like to know what the big picture is. Anyways, I hope you found my post here useful. And hope you will be able to find time to answer my questions. Thank you in advance! thanks for your comments. I think you do a good job of describing what I would call moderate or pragmatic or utilitarian libertarianism–as opposed to the fundamentalism, absolutism, or extremism I am attacking in my essay. I’d broaden this to “do no individual or collective harm” rather than “do not impede the freedom of other people”, even though one might argue they imply the same things. Pragmatic or utilitarian approaches to society are marked by diverse checks and balances and emphasis on empirical data over ideology. Advance planning and design need to be balanced with empirical results (impartially measured) and continuous improvement. In effect, quality control is even more important in social engineering than it is in physical engineering. I think social engineering should be ideologically agnostic and it should eliminate externalities as much as possible. Another way to say this is that the feedback for social engineering quality control should be equally representative of all demographics and should accurately account for all life-cycle impacts (costs and benefits) across the entire ecosystem. At the present state of the art much of this has to be estimated, but there is no excuse for intentional or willful externalities. What we’ve had thus far are economic and political systems in which accounting fraud and false narratives evolve more rapidly than our objective analytical competence.